Alive and well and making a comeback. Patrick Leclezio reports on a proud South African tradition. First published in Prestige Magazine (February 2015 edition). I champion the mantra drink better not more. Admittedly this is hardly a ground-breaking proposition, but it’s a wise sentiment by which to live, and it warrants advocation even at the risk of being obvious. Occasionally, I’ll cut loose and tag on or more of better, but that’s another, less responsible story. If you’re in agreement or indeed you’re already following this approach in your consumption of alcoholic beverages, then let me inform you, in case you hadn’t noticed, that you’re living in an unprecedented golden age. We are happily awash with a greater choice of premium drinks than ever before – and that’s an observation that applies equally to our home-grown fare. Rousing stuff! The quality over quantity ethos is an easy sell if the quality is in abundant and varied supply. A significant contributor to this agreeable state of affairs is the rise of “craft” – the term used to describe independent, small batch production. This is has been particularly evident in beer, where an array of brands such as CBC, Darling, Citizen Alliance, Birkenhead, and the ebullient Jack Black, to name just a few, are offering refreshingly varied, exceptionally flavoursome, and strikingly compelling alternatives to the bland, industrial lagers that have long dominated the market. It’s all the beer I drink now, and not because I’m a hirsute hipster who feels compelled (I’m neither) – but because it’s damned good and well worth the extra cost. Now unless you’ve been living under a rock I’m not telling you anything you don’t already know. You may be less aware however that forging this new frontier shoulder-to-shoulder on the front lines with its malted brethren is South Africa’s signature spirit: brandy. South African brandy has taken a savage beating in the last decade; it’s saddled with significant problems, yet to be overcome. Things though may be starting to change. The calibre of our potstill brandies, on which increasing emphasis is being placed, is outstanding, and in craft producers, most of whom focus on the potstill style, we have a group of people that is committed to the cause, that is passionate about brandy and about its importance to our legacy, and that has the skill and impetus to make a difference. I should perhaps rein myself in a touch at this point. Craft doesn’t necessarily mean better. Actually when you consider the comparison in resources between a craft and an industrial producer –a yawning chasm – it’s perhaps surprising that it has anything to offer. Micro-producers however enjoy decisive advantages in that they’re small and unconstrained, which translates into an ability to make something that is special and individual. If they want to use a specific, unusual varietal, grown on a particular patch of land, under the influence of a certain type of climate – no problem. If they want their maturation in first-fill Muscadel casks from a tiny boutique winery – done deal. They just go for it. Special and individual then. These are not insignificant attributes, as any fine spirits aficionado will attest. 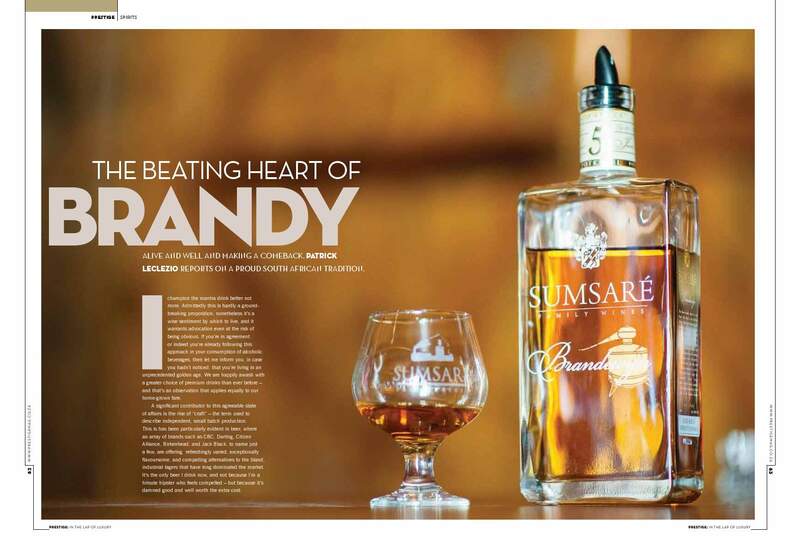 A case in point is the Sumaré 5 year old, crafted at Wandsbeck in the Agterkliphoogste area of Robertson. This is as singular a brandy as I’ve ever tasted, spicy and fruity as one might expect, but more strikingly layered by an appealing and unusual (in my experience) coconut flavour. It’s soft and elegant, and whilst a bit thin, perhaps another few years in wood would benefit, it’s nonetheless an outstanding example of the distinctiveness, the individuality, offered by these craft brandies, and a delightful brandy in itself. Craft brandies are usually associated with a farm, hence also referred to as estate brandies. They are special in both the flavour of the liquid, but also in the flavour that they provide to the brandy environment. Fine spirits are about so much more than the product. They are about the people who make them, about history and heritage, stories and anecdotes, about background, about a place and its visceral energy, the sights, sounds and smells, and about character. We as brandy drinkers and brandy lovers want to know what it is about a product that makes it special. Sumaré distiller Danie Erasmus regales in his story of a near-miss, when a still malfunction caused a fire that almost burned down the historic stillhouse building. The burn marks are still visible on the ceiling, there to be seen and touched and spoken of, a testament to the experience (that we can all enjoy, albeit vicariously) of creating this wonderful brandy. In fact tales of distillery fires and explosions abound. Craft distillation is clearly not for the faint hearted. I’ve meandered my way through a small corner of this expanding universe. Kingna 5yo, a brandy made by a former diesel mechanic is maybe – I’m using some poetic licence – a reflection of its creator: solid, reliable, and satisfying. It’s not the most subtle or complex brandy, but I can see myself sitting around with friends, enjoying their company over its warm, hearty, full flavoured glow. Grundheim, a 9yo brandy from Oudshoorn, is matured in re-toasted port casks, as evidenced by its mahogany colour and its intense flavour. Mons Ruber, claimant to a history of distillation stretching back to the 1850’s, is old and bold, a 2003 vintage that I found a little unbalanced, but challenging and interesting. The Green Kalahari based Bezalel uses a variety of cultivars, including, rather unusually, red grapes, in making its brandy. It in particular epitomises the concept of terroir that largely defines these estate brandies and sets them apart, with the region’s climate and soils premised to have a deep influence on the product. There are many others, in a growing list. South Africa has become home to a bona fide and comprehensive brandy route. Any discriminating drinker, any disciple of the better not more philosophy will not be disappointed. You’ve heard of three cheers? Allow me then to propose the brandy customised six cheers – as in clink drink, clink drink, clink drink…and hip hip hoorah. 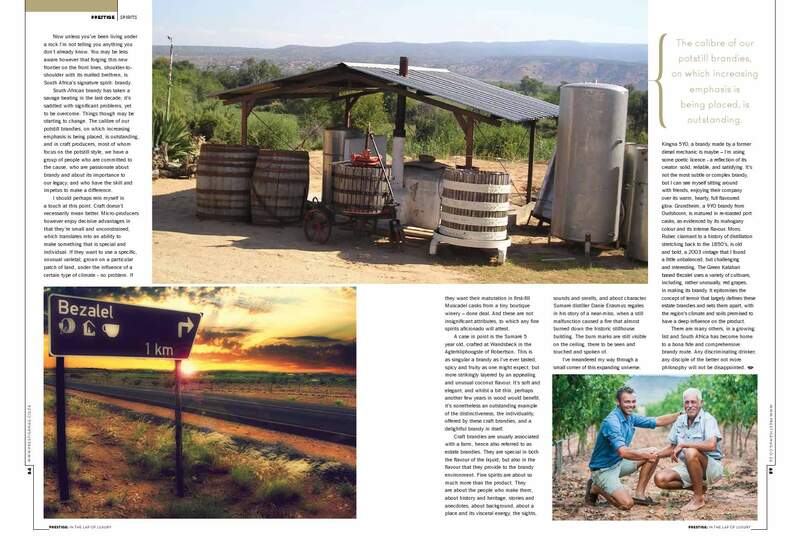 This entry was posted in Spirits column and tagged Bezalel, brandy, Brandy Foundation, craft, Danie Erasmus, Grundheim, Kingna, Mons Ruber, South African brandy industry, Sumsare. Bookmark the permalink.